Posting evergreen content to your website ensures you have a number of articles that don’t fade in utility over time. Unlike information that will become irrelevant as things in the industry change from day to day, evergreen content will stand the test of time and offer benefits to both your ability to find new website viewers and your position as an expert in your field. What makes a piece of content evergreen is that it’s as relevant next year as it was last year. It’s timeless. Instead of being a flash in the pan that quickly generates views and then stops getting hits when new, updated information becomes available, it sticks. Evergreen content deals with topics that aren’t constantly changing. If you post a piece of evergreen content today, it could still draw in clicks from a search engine in five years. When you post a piece of time-sensitive content, it may ramp up your website visitor count for a few days or weeks, and then fade away. As the information becomes less relevant, it will decrease the amount of clicks a piece can get. While time-sensitive content does help get people to your page, evergreen content will be able to generate a higher volume of clicks in the long-term simply because people will still see and respond to it as time goes by. If you haven’t developed pieces with evergreen content in mind before, here are a few examples that can help get you started. – Even product guides for products that are older will stay evergreen as long as people continue to use the old model. – People will always need an entry-level approach into your topic. Try keeping it basic and your piece will stay relevant in the long term. – If you do original research, pair your results with an explanation of how you got them to offer new information that will stand the test of time. 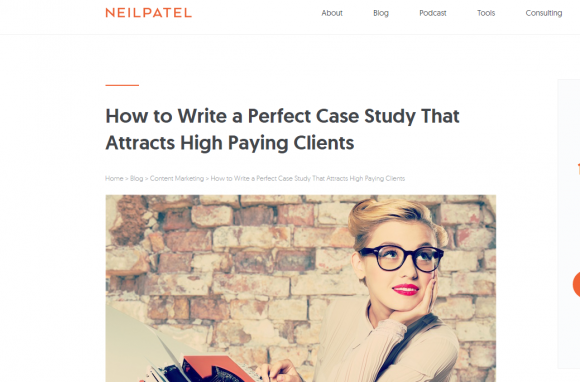 Neil Patel’s excellent case study on writing case studies, very meta! – The definitions for words rarely change. When someone searches for a word, your website may be the result they choose on Google. Going into depth about a term and its history may offer even more utility. – Lists of unchanging information offer both an attractive format and evergreen content. 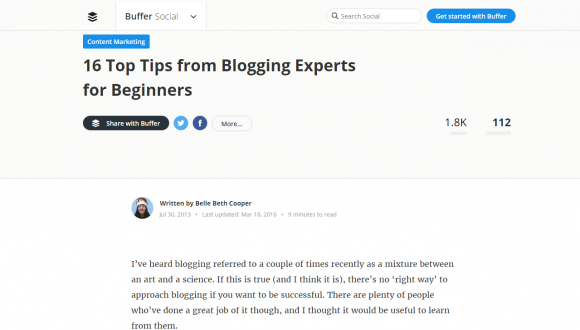 Bufferapp’s blogging tips post is 4 years old and still being updated! – Connect with thought leaders in your field and ask if they’d be interested in an interview via email or Skype, many people will welcome the exposure! 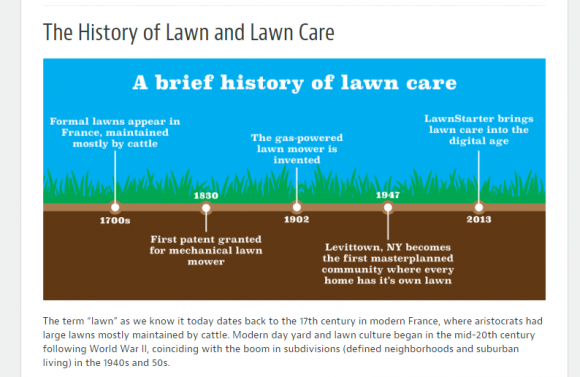 – Since history doesn’t change quickly—even while some industries create new history every day—a page offering historical or encyclopedia content can offer utility for years to come. – News stories are one of the most common content types that are time-sensitive, not evergreen. – Though they may be relevant each Christmas or fall, for example, they won’t generate clicks all year and will die off almost completely when the holiday or season isn’t taking place. – Since trends change every year, discussing them is always time-sensitive. The nature of trends also means that old ones quickly become irrelevant and are replaced with new, current ones. The best way to reach everyone is to post a mix of evergreen content and time-sensitive content. However, unless your site is focused on providing up-to-date information and being on the cutting-edge of a topic, it’s better to focus on evergreen content. As you build a library filled with evergreen content, you’re also building up a series of links and webpages that help draw people to your site. Every new piece of content you offer is another link in the chain that brings new viewers in and helps grow your business. Another way evergreen content can help grow your business is by generating social shares. The more relevant something stays over time, the more likely it is that a person will share it on their social media profiles, connecting your business to their friends, relatives and business associates. So instead of pulling in a bunch of views at once that quickly dissipate, you can get organic clicks through quality content that encourages shares. If you update your site five times per month, try to make sure at least four of the five updates are evergreen content. The last one can be a piece of time-sensitive content that draws in viewers interested in something trending quickly and helps give your site a temporary boost in traffic. Publishing evergreen content can affect your search ranking, which has a direct effect on how many people visit your website. According to Search Engine Watch, sites that focus on evergreen content get more clicks on pages that offer evergreen content. Those pages are the most popular. Similar sites that focus on time-sensitive content are more likely to get clicks on their homepage and other static pages, rather than time-sensitive articles. In other words, evergreen content draws more clicks than time-sensitive articles in many cases. The same post also explained that, of the two sites they compared, the one that focused on evergreen content got more recurring traffic from their articles and has greater search visibility in similar topics. So if you’re looking to grow your audience and your business, focusing on evergreen content can boost your search rankings for the terms you want to target. 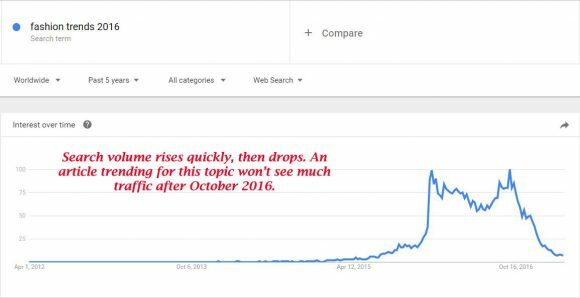 When Harsh Agrawal added dates back to his evergreen content his traffic dropped by almost 40%. 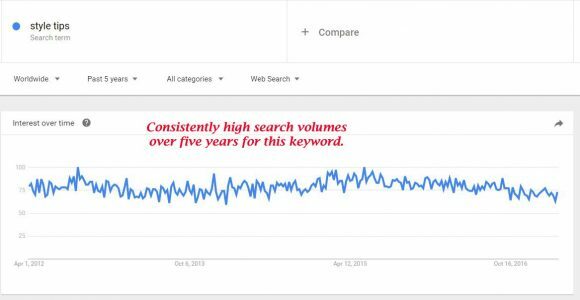 One aspect of SEO that evergreen content affects is keywords. Choose good keywords and phrases that will drive traffic to your site, and then use them in your content. 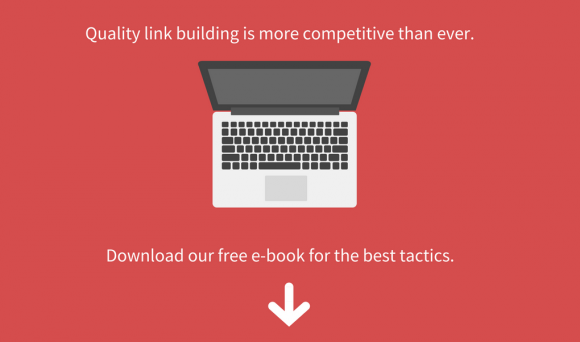 Doing so will help your site rise in the search results until it’s more visible to searchers. For example, targeting a term like “wooden furniture repair” may be hard to rank for at first because there are millions of results on Google. However, as you generate more evergreen content, search engine crawlers are going to pick up more from your page. When you write evergreen pieces that use the keywords you’re trying to rank for, and those words are picked up by the search engine crawlers, you’re going to get boosted in rank for that term. 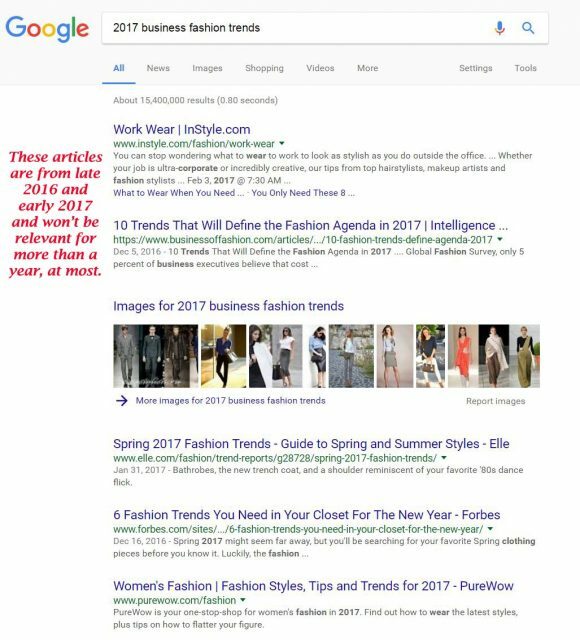 The pages those keywords exist on give you a better boost in search results if they’re not out-of-date and if they have more traffic. Since evergreen content produces more views over time, it will be favored over time-sensitive content when being indexed by Google and other search engines. This means that pages that use your keywords and feature evergreen content are more likely to be visible to customers who search for those keywords over time. 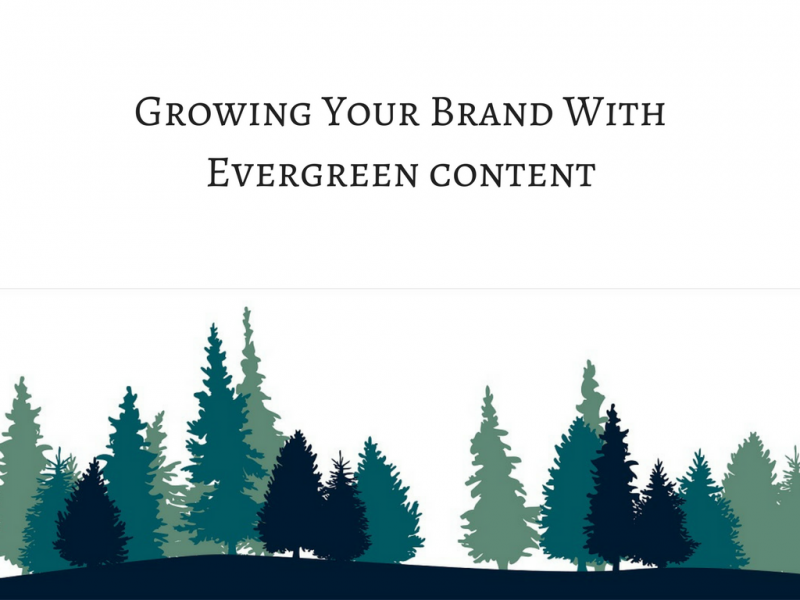 Evergreen content also offers the benefits of giving you brand authority. Brand authority shows that you’re an expert in the area of your business and offers them confidence in trusting that you can provide the best possible product or service. One way to both gather evergreen content prompts and increase your brand authority is to take questions from customers on your social media profiles. 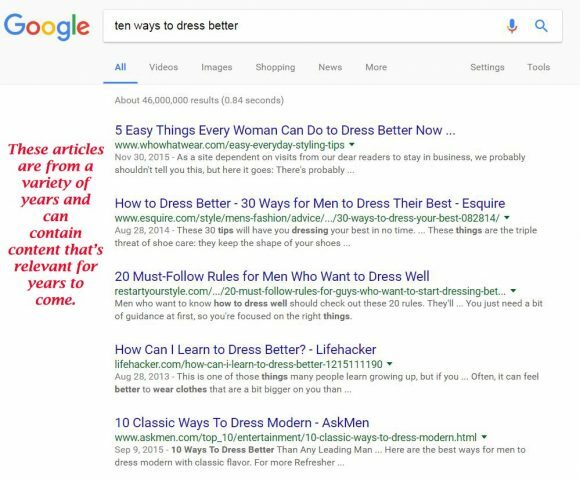 Answer the questions in a frequently asked questions page or on its own page, if warranted, and then you have new evergreen content that someone could perform a Google search to find. Another strategy is to publish interviews with experts or people well known in your field. Not only will it give you a new set of keywords, but it will show that you’re plugged into your industry and knowledgeable in the field. Interesting interviews also serve as another type of evergreen content. As always, the most important way to offer utility and increase your brand authority is to offer well-written, honest and high-quality information in your evergreen content. Not all evergreen content has to be writing. One way to increase the effectiveness of an instructional video, for example, is to illustrate the process of something hands-on with a video or pictorial. You can make a mix of content types before posting in order to give your audience the best return for their click and also to keep them coming back to you for more information on other topics. Try making a question and answer series to generate some fresh evergreen content. Other people may be searching for the same questions other viewers have, and answering those questions on your site will draw those people to click on it. As long as the answers aren’t dealing with news topics or trends, the question-and-answer format is an easy way to post solid evergreen content. Another way to get creative is to use interactive content. 75 percent of respondents agreed that interactive content can “provide a ‘sample’ of the brand, resulting in a higher degree of lead nurturing,” according to a survey by the Content Marketing Institute. This means that you can use interactive, evergreen content as part of a long-term strategy to grow your business by introducing your brand to new customers. Will this still be relevant to a viewer in one year? Two years? Five? The longer it will be relevant, the more evergreen it is. Does this deal with a topic that will fade in importance over time? Topics like family, technology, relationships, education and healthcare may change, but the fundamentals stay the same. They’re always important and people will always be looking for content on those topics. Since experts may not need basic evergreen content as much as beginners in a topic, write for a wider base of people. While it’s fine to write to the group interested in your niche business, you’re less likely to get clicks if the content isn’t accessible by a person searching for your keywords. Is this topic already covered? Often, it feels like topics have already been done. Don’t let that deter you from making similar content, because you can put your own spin on it and offer new utility. Whether it’s the content itself, the accompanying images or your own specific authority on the topic, don’t let the fear of repetition stop you. Is there a way to make this more niche? Another way to ensure your content offers new utility is to delve into a niche that isn’t as covered. If you are in a very specific field, it will be easier to generate evergreen content that doesn’t feel repetitive. Is there a way to make this more relevant in the long-term? Can I add media that makes it more useful to viewers? Before hitting publish on your article, check to see whether it connects to other articles on your site. If it does, include links from that article to another one. It will help your search engine ranking and lead visitors to other areas of your site and new topics they might not have considered. Update pieces as necessary to keep them evergreen. If you’ve written something about the history of a specific type of technology, you can go back and add a new bullet to your timeline in just a few minutes. Doing so will keep the page relevant and offer better, more complete information to visitors. The more complete your coverage of a topic, the better your expertise will appear to viewers. This can help grow your business by giving a customer confidence in your products and services. Ultimately, publishing evergreen content will help build your business by drawing in new viewers and making your site into an authority on its topic. Over time, evergreen content will build up until you have a series of links and pages that draw in new customers and get your offerings in front of them. While there is a place for time-sensitive content, a marketing strategy that focuses on evergreen content should deliver better results in the long-term. Should We Give In To Clickbait When Creating Content? Awesome blog post written along with great content and writing skills. An evergreen content always requires great skills and inner magic of how to write something on a certain topic. By the way I am new in this blogging world and have started my own blog too on malware removal guide. Thank you, Ashley! Evergreen content is definitely an important part of running a great site. Congratulations on your new blog! Thank you, Dheeraj! I really appreciate that.